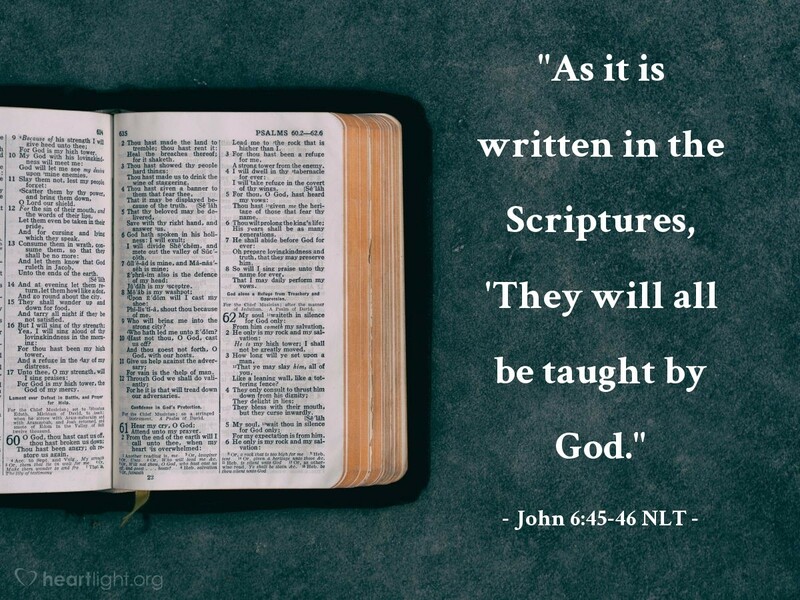 [Jesus said,] "As it is written in the Scriptures, 'They will all be taught by God.' Everyone who listens to the Father and learns from him comes to me. (Not that anyone has ever seen the Father; only I, who was sent from God, have seen him.)" Sometimes we miss the exclusive claims of Jesus because we've heard them so often. This claim is bold: "If you have learned the truth from God, then you are going to come to me!" Jesus not only claims to be the only way to the Father and the only one who has seen the Father, but he also claims that anyone who really knows God recognizes that he has come from God. Jesus comes to lay claim on your heart as a God-seeker. Have you yielded to him? Father God, you are awesome in might, righteousness, and faithfulness. No one is comparable to you. Please bless me, dear Father, as I seek for you in the Scriptures. Please reveal yourself to me and reconfirm the identity and uniqueness of your Son as I study your word and I am guided by your Spirit. In Jesus' name, I pray. Amen.